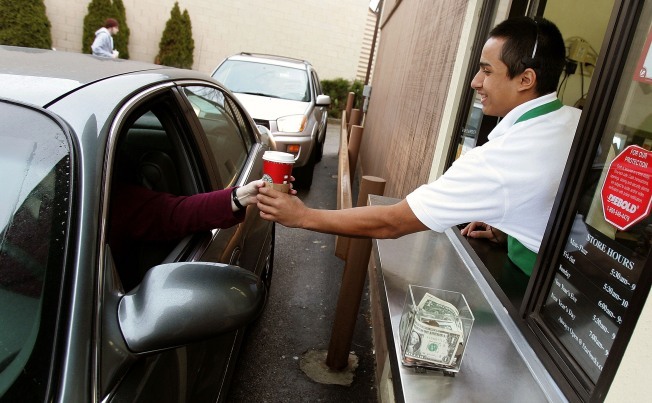 Starbucks worker Freddie Arteaga assists a customer with her drink order at a Starbucks drive-thru in Wheeling, Illinois. Starbucks is bring the “tall” back — to its drive-through menus. Last week, the coffee giant created a stir when it confirmed it removed the smaller, 12-ounce “tall” size from the menus customers see from their cars. The decision meant that people ordering at the drive-through generally only saw the larger 16-ounce “grande” and 20-ounce “venti” coffee drinks. The company said the decision was meant to simplify its menus, and that customers were free to still order the 12-ounce drinks if they wanted to. But many customers appeared to see it differently. On Tuesday, Starbucks said that it had decided to reinstate the tall size on its menus after hearing customer feedback. “We want to make sure there is no confusion and that our menu reflects a range of price points,” the company said in a message to employees. Spokeswoman Deb Trevino e-mailed the statement to msnbc.com. Starbucks said it will begin updating the drive-through menus to again show the tall size this Thursday. The tall-less menu, rolled out nationwide and in Canada at the end of August whittled the offerings down to about 25 of its most popular items. Trevino said at the time that the larger sizes are more popular. Take a coffee break and follow me on Twitter at alinnmsnbc.